Four weeks ago I managed to put pen to paper to describe the aftermath of a grand final loss. I pushed perspective into the background. I didn’t want to know about it. I even told it to f… off, just for a while, which, admittedly, wasn’t very a very nice gesture. But that’s how I felt. The days wore on, the sadness lessened and the little things in life gradually filled the emptiness that surrounded me. All the while, perspective, in its meaningful and enlightening ways, kept reminding me that soon enough it would get me back into the land of the living. It took a while, but finally I was able to give that much needed point of view a good shaking, and admit that perspective was now possible. I was visiting a hospital for a pre op run down, having waited over a year for a much needed cataract removal operation. I walked through the children’s section of the Eye Clinic and the intellectually challenged kids brought me to my senses. Some of them had no sight, some just a little. I had full sight, and I was grateful. It was funny, so I decided to play along with it. I had the operation a few days ago, and decided that one-eyed was the way to go! That’s a wild photo, Jan! I don’t think the hospital gave you that swan patch. When you become two-eyed again, I hope you’ll see the greatness of the Swans even more clearly. Cheer cheer! They can remove the bandage Jan but the Swan will remain rusted on. Can’t be shifted, surgically or otherwise. Perhaps you should have asked the surgeon to bung in a couple of Swan eye-inserts while you were under. A bit like those Bond-villains. Either that or a prominent Swan tat. The Bulldog supporter web-site is full of people showing off their premiership tats, even people our age. No, the hospital certainly didn’t give me the Swan patch. 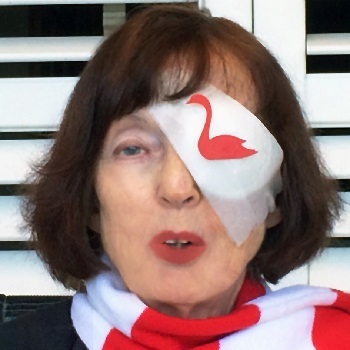 A woman who had bought my book (Debra) kindly sent me a range of her lovely artworks, including little red and white swan cutouts, and when I got home from the operation I thought of them and blu-tacked one onto the bandage! Even though the bandage is now off, the drops regime in place and having to put up with the soreness, the imaginary swan has found its way through the eye mechanisms and embedded itself deeply into my brain, helping to prepare it for another one-eyed onslaught next year! The other eye also needs doing, but that’ll have to wait until after the footy season. At least next year I should be able to actually see the game more clearly: reds are now reds and the whites don’t have a creamy/yellowy tinge! The miracles of modern medicine, and the gratitude that we live in a country that can perform those miracles for one and all! Yes, I know about your glasses. Love them! I have certainly thought about red and white ones, but ironically, red is not really a colour that suits me or I choose to wear except on footy days. It’s strange at the moment only being able to read and look at the computer screen with one eye, Have to wait at least four weeks before I can have the glasses prescription adapted to the “new” eye. And, as you probably remember, the reading component of either the glasses or the eye itself, changes considerably when a cataract has been removed. So, I’m sitting here, with the left eye of the glasses covered in a patch and reading through the right eye of the prescription glasses. Just takes getting used to, and again, appreciating that at least I can still see! And, adapting to getting older!! Glad to hear you’re on the mend Jan, and glad you’re keeping your eye in, so to speak. Keeping the eye well and truly in!